UPDATE: Populist billionaire candidate Andrej Babiš and his party ANO have won the 2017 Czech Republic's general election. Czech men are said to be connoisseurs of beer, football, and politics. These traditional areas of knowledge can now be joined by political marketing. The swift rise of billionaire Andrej Babiš and his movement ANO (Yes) three years ago drew attention also to his professional campaign, which was seen as one of the reasons for his success. Pundits and commentators spoke and wrote about a “marketing product without content” and beer-related knowledge was enriched with know-how on “how to conduct a campaign”, as well as a fascination with this art form. Marketing certainly served Babiš well, but the reasons for his long-term success should be sought elsewhere. Despite the confrontational rhetoric of its leader, the campaigns of the movement are always mild and contentless, dominated by slogans like “Things will get better” or “We want a better Czech Republic”. Babiš understands democracy as a collection of formal rules with which he has to somehow deal – though in the interests of his“capacity for action”, there’s no need to overdo it. Reaching second place after the traditionally leading Social Democrats in 2013 in pre-election surveys was certainly a success for the movement, which received almost twenty per cent of voters’ support. A complete victory was moreover prevented only by the early elections that year. If they had taken place half a year later as planned, Andrej Babiš would probably already be Prime Minister. Even so, he became Minister of Finance, Deputy Prime Minister, and the official “co-ruler” next to social-democratic Prime Minister Sobotka. Since then, the movement – or rather political company – has not taken a break. In 2014, it won in local elections across the whole country, including Prague, and last weekend it was successful also in regional elections. If nothing unexpected happens, next year ANO will consolidate its dominant position and win in its second parliamentary elections. It will thus take control of the government, regional assemblies, and municipalities. The latest election results thus only confirm the set course. The ruling Social Democrats and right-wing parties associated with austerity policies of 2006-2013 are slowly losing support, while Andrej Babiš goes from strength to strength and is still able, even despite his government engagement with the Social (and Christian) Democrats to convince the public that he will “sweep the old structures away”. What comes as something of a surprise is that none of the far-right parties capitalizing on the current wave of anti-immigrant and Islamophobic sentiment were successful in the elections (with the exception of the somewhat bizarre project of Japanese-Korean Czech Tomio Okamura, which narrowly made it into several regional assemblies). How do we explain that in a country with such a high rate of aversion towards Muslims and refugees from war-torn regions, the Far Right remains marginal? The answer is simple. The governing parties, headed by ANO’s leader Andej Babiš, are already doing a great job in offering an agenda similar to theirs. Until Angela Merkel’s decision to accept Syrian refugees stuck in Hungary, Babiš was more or less silent on the topic. But as soon as criticism of Merkel became more prominent in the Czech Republic, Babiš too understood that it is politically profitable to take advantage of this sentiment. But to reduce his popularity to reaping the fruit of anti-Islamic hatred would be a huge simplification. The anti-immigration theme rather only added another element to Babiš’s rhetorical repertoire. Similarly to President Zeman, Babiš has profiled himself as a crusader against the corrupt establishment and champion of honest Czech workers, who deserve better for their diligence. Protection against Islam is thus part of taking care of the Czech worker and the criticism of incoming refugees is part and parcel of his criticism of incompetent politicians (this time European ones). Babiš’s basis for critiquing politicians was always their incompetence and corruptness, with which he set himself against. He is not subject to either of these characteristics – proof of his competencies is to be found in his successful company Agrofert, and proof of his incorruptible nature in his massive wealth. Babiš has repeatedly spoken positively about Hungarian Prime Minister Viktor Orbán. Not that he shares his anti-European ethos (his agrochemical industry is too dependent on European subsidies for that), but he is impressed by Fidesz’s ability to govern with a comfortable majority, not having to worry about making any compromises. He was equally sympathetic towards the “capacity for action” of Slovak PM Robert Fico, at least as long as this politician was leading a single-party government. Earlier, Babiš also used to praise Angela Merkel and the German system of supporting entrepreneurship. Three years ago, the Czechs were casting their eyes towards German prosperity, rather than Hungarian authoritarianism. But the image of the West changed in recent years and the widespread notion of affluence and democracy was replaced by a vision of omnipresent Islamist terror and dangerous ghettoes. Babiš’s approach to the EU is pragmatic: “They give us money, so our membership is advantageous for us”. Idealist enthusiasm for Europe is not his thing, and he calmly criticizes idiots from Brussels divorced from reality, though at the same time, he does not want to lose Euro-money. This position allows Babiš to criticize both pro-European and anti-European attitudes. Similarly pragmatic is his attitude towards the communist past and the “wild nineties”. He was never entirely able to refute allegations of his cooperation with the communist secret police and there are similar questions hanging over how he miraculously managed to get rich in the 1990s. But paradoxically, this does not harm him. He is no advocate of ideological anticommunism, in his 2013 campaign he even praised certain aspects of the communist regime; yet at the same time he wanted to prevent the return of the communists through his own entry into politics. He has criticized the era of mafia capitalism of the 1990s, during which he became a millionaire; yet he has repeatedly praised Czech businessmen, who just like him worked their way up at that time. And his attitude towards democracy is similar: he is not its ideological enemy, but understands democracy as a collection of formal rules with which he has to somehow deal – though in the interests of his “capacity for action”, there’s no need to overdo it. Right after the regional elections, Babiš expressed his view on managing the country in an interview for Czech Radio. He wants “the Czech Republic to be like one big family-owned business”. He basically only made more precise and broadened his unofficial 2013 election slogan of “running the state like a business”. And it looks like he really is running the state like (his own) business. The consolidated profit of his company Agrofert rose in 2015 from 6,1 billion to 8,7 billion Czech crowns and Babiš is, according to Forbes Magazine, still the second richest man in the country, as his total assets grew by 6 billion in one year. 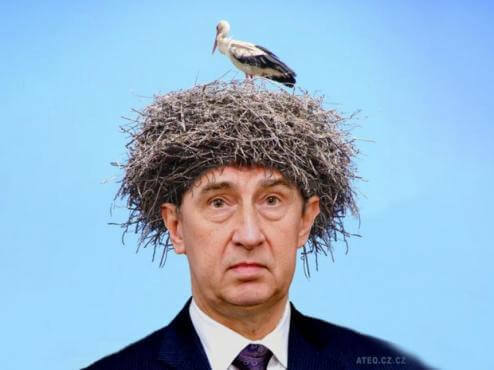 What’s more, the European Anti-Fraud Office (OLAF) is currently investigating a possible subsidy fraud in the allocation of European funds to Babiš’s country estate known as “Čapí hnízdo” (Stork’s nest). OLAF is allegedly also investigating whether Babiš is not influencing the distribution of European subsidies to the advantage of his company Agrofert. As Finance Minister he of course has all the necessary tools to do so. International media often portray Babiš as a Czech Berlusconi or Trump. The comparison with Berlusconi seems appropriate, as Babiš bought up almost a third of the Czech Republic’s most significant media in June 2013, thus strengthening his position shortly before the early parliamentary elections. But there is one important thing in which he differs from Trump or Berlusconi. Babiš does not lead an eccentric lifestyle and rather styles himself as an ascetic workaholic, sacrificing himself for the good of the nation, just as previously he sacrificed himself for his company. He has the image of a simple, sober, and strict person who doesn’t beat around the bush and has no time for idle talk. That is probably his most significant characteristic with which he impresses Czech voters. Babiš represents and has paradoxically brought to a conclusion the doctrine of non-political politics, which established itself as a reaction to the authoritarian communist regime in Czech public space after 1989. He is able to naturally take advantage of the widespread opinion that politics is filthy business conducted by amoral individuals, who are only seeking personal profits from their political engagement. And there is no reason to deny that the last twenty-five years have brought them many such possibilities. are writers and editors of the Czech progressive daily website A2larm.cz.